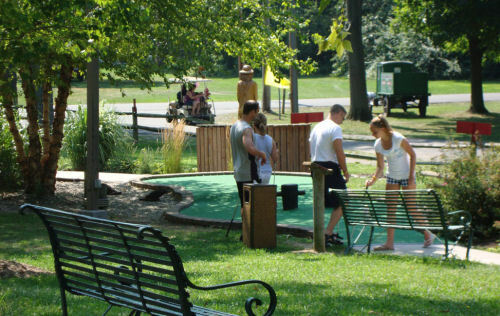 Come by a round or two of mini golf at The War of 18 Holes Miniature Golf Course at Perry’s Cave and Family Fun Center. The only mini golf course on the island, this game is positively historic! Learn all about the battles of the War or 1812 while enjoying the lovingly manicured course. Perry’s Cave and Family Fun Center. Perry’s is one of the island’s favorite attractions. Located on Catawba about a mile from downtown, Perry’s is full of fun. Besides the mini golf, visitors can challenge their friends to the Fort aMAZEn maze or the 25 foot Rock wall. A tour of Perry’s Cave is always thrilling. Descend 52 feet underground to see amazing rock formations and the lake Commodore Perry used for his troops. There is also Gemstone Mining, an activity fun for the whole family and the Butterfly House. The Butterfly House contains over 50 species of butterflies, beautiful flowers, and soothing music. Dan Dee’s Snack Shack is onsite to quench your thirst and keep you going with french fries, fish baskets, and ice cream. A covered bridge, waterfall cave, and lovely winding paths are all included on the course. A really fun activity for both kids and adults! Although it is easy to spend all day at Perry’s, there is still plenty to do in the area. Heinemans Winery is right across the streets. Pick up a bottle of wine and tour their own Crystal Cave. Joe’s Bar is a local favorite. This wonderful dive bar is friendly and relaxed. For an upscale dining experience, head to Goat Soup & Whiskey.